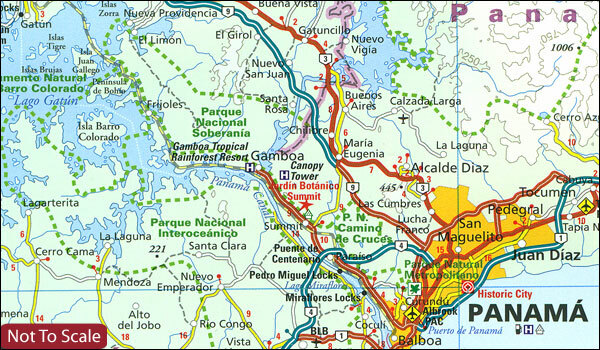 Indexed, waterproof and tear-resistant road map of Costa Rica and Panama at 1:550,000 with topographic and tourist information, published by Reise Know-How as part of their highly acclaimed World Mapping Project. The map is double-sided, with a good overlap between the sides, to provide the best balance between a good scale and a convenient size sheet. Topography is presented by altitude colouring with contours and spot heights. Swamp areas, mangroves, seasonal rivers and lakes, and reefs are also indicated. Internal administrative boundaries are shown with names of the provinces. Road network includes un-surfaced local roads and tracks, and indicates driving distances on main and secondary roads and border crossings. Railways, harbours and local airfields are also shown. 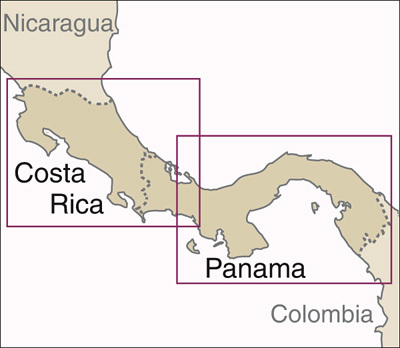 National parks and protected zones, including turtle protections areas are clearly marked. Symbols indicate numerous places of interest, including UNESCO world heritage sites, churches and archaeological sites, camping sites and selected hotels, hot springs, viewpoints, beaches and surfing or scuba diving locations, etc. The map has a latitude and longitude grid at intervals of 30’ and an extensive index of localities with a separate list of national parks and reserves. Map legend includes English.